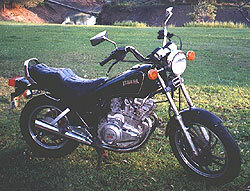 UBG Says: Marketed as Yamaha’s alternative to the Honda SuperDream 250/400s, it lost out in many ways. Quick rot cycle parts and pipes, carbs that made starting a gamble at times didn’t help. Nor did the crank and gearbox box problems that arrived after 30k. There were several variations including an SE Custom version that lacked performance. The 400s are rare and neither the 250 or 400 are in the same class as the RDs.